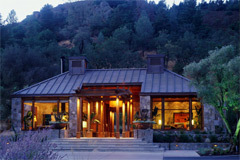 A luxury ranch tucked away in the heart of California's Napa Valley. A place to escape city life with it's own lake and surrounded by West Coast forests. This ranch retreat is popular for its spa facilities and surrounding nature. The restaurant serves up hearty, wholesome food that you'd expect in a place like this and prides itself on its well-stocked cellar. The 46 lodges are free-standing for ultimate privacy. Relaxed and peaceful, they provide an indoor / outdoor living experience, with log fireplaces, flatscreen televisions and DVD players as well high-speed internet access for those that need to stay connected. Napa Valley's hidden luxury lodge ranch has its own lake, a relaxed Californian vibe and a gorgeous nature-fabulous outdoor spa. The 46 lodges are free-standing for ultimate privacy. Relaxed and peaceful, they are an outdoor/indoor living experience, with log fireplaces, flatscreen televisions, DVD players and high-speed internet access. The Lakehouse restaurant - overlooking Lake Lommel, is a beautifully romantic and refreshing setting for a culinary feast or casual bite. Each dish is a pure reflection of fresh organic and local produce, complimented by an extensive wine list. The dining Lounge is perfect for a taste of one of the region's renowned wines or a classic cocktail at sunset. The ranch can arrange for a chef to come directly to the lodge. The Spa reinvents the classic curative “taking of the waters” in a rejuvenating natural Napa spa sanctuary. Nestled away in a wooded canyon in Napa, discover soothing soaking pools overlooking a creek and moss-laden oaks, sample restorative organic treatments in restful private rooms and enter upon a journey to pure relaxation. Tranquil treatment rooms feature outdoor garden showers and private soaking tubs. Take to the healing mineral waters and enjoy a variety of exceptional bodywork and unique treatments, soothing soaking baths reflect the true spirit of the Napa region. FOUNDERS ROOM - the exclusive, 1175 sq. ft. Wine Cave offers romantic allure with details like wrought-iron chandeliers and an entrance bedecked with trellised vines and flowers. For rehearsal dinners to award ceremonies, the atmosphere invites a night of fine dining and dancing and the Founder’s Room offers perfect placement for a signature cake or coffee. LOMMEL LAWN - A wooden bridge leads guests down to a spectacular 180 degree view of our private canyon and stunning lake, at the lush Lommel Lawn. One of Napa Valley’s most scenic wedding locations, it accommodates up to 120 guests within its 3450 sq. ft., with an adjacent area for cocktails and reception and also is a perfect choice for a company picnic or casual gathering. LAKEVIEW SUITE – LAKEVIEW PATIO / LAKEVIEW ROOMS 1 AND 2 - Boasting an incredible view of Lake Lommel and the bordering mountain range, this lovely suite is a true treasure. The shaded, 615 sq. ft. patio sits adjacent to two intimate rooms, each of which features 245 sq. ft., with french doors and floor to ceiling windows for an abundance of natural light to make your dinner party, meeting or cocktail gathering all the more brilliant. The Lakehouse Restaurant and Patio - 1450 sq. ft. of outdoor and indoor seating separated by floor-to-ceiling glass doors that fold back to unify the space. Combined with the bar and lounge areas, it’s a perfect setting to enjoy the beauty of Lake Lommel and surrounding hills. The Lakehouse Restaurant and Patio space is available for lunch events only. THE CREEKSIDE CLUBHOUSE – THE CANYON ROOM / THE VALLEY ROOM - Give your state of the art meeting, casual breakout or group dining event a natural new twist, with the flexible, beautifully refreshing Creekside Clubhouse. In a breathtaking, naturally designed space equipped with the latest technologies and amenities the 1600 sq. ft. space includes a nicely outfitted living room and two smaller breakout rooms, plus a 485 sq. ft. outdoor area. POOLSIDE PATIO - At the northern end of our shimmering swimming pool, an expansive, 1530 sq. ft. terraced patio featuring striking views of the hillside and adjacent vineyard. An ideal location for a wedding ceremony or any convivial al fresco event, the poolside patio can also be used in conjunction with the upper terrace for a cocktail reception. UPPER TERRACE - Situated just above the pool, this 675 sq. ft. patio area is ideal for a savvy cocktail reception, inviting meal or casual get together and could be perfect for expanding an event with the larger poolside patio below. The Napa Valley and the town of Calistoga enjoy beautiful weather year round. Sunny Summers lead to Fall’s harvest and temperate Winters are accented by brilliant mustard fields which transform to the glorious green hills of Spring. Summer days in Napa can reach about 80° F, cooling to the 50°’s in the evenings; Winter days in Napa average around 60° degrees. Whatever the season, unspoiled scenery and comfortable climates create a destination with great natural appeal.